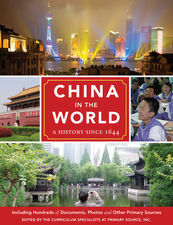 China in the World (book and CD-ROM set) explores China’s captivating history through engrossing historical narrative and hundreds of primary sources. Unit overviews, introductory essays, and time lines provide the context for appreciating the events and implications of China’s complex history. A wealth of primary sources—imperial edicts, sea captains’ letters, short stories, poetry, essays, posters, photographs, and cartoons—allows students to explore events from multiple perspectives and through many genres. Primary source-based activities foster analytical thinking, hone verbal skills, and ask students to consider history as a complicated, messy, and fascinating subject.